non CA residents and renters. There are a number of easily reached trails in the Bass Lake Area which can be used to enhance your visit to the area. For all trails, bring lots of drinking water and wear appropriate hiking footwear. Most trails have easy to moderate slopes with a few having steep slopes. Plan to take your time and your camera! Please pack out all trash you pack in and stay on designated trails. Cutting across switchbacks causes erosion of soils and trail damage. One of the most challenging trails is the Willow Creek Trail (22E03) which can be reached either by the North Shore Road next to the Falls Day Use parking area or from the Willow Creek parking area off of Road 274. The trail is two and seven tenths miles long, ending at the McLeod Flat Road and offers moderate to steep climb. The main attractions of this trail are Angel Falls and Devils Slide, two breathtaking water falls, and a variety of quiet spots and scenic views along the way. Along with the spectacular waterfalls, Willow Creek presents dangers in its extremely slippery rocks and swirling pools. These can be deadly; many people have been injured and some have lost their lives. Please be careful and stay on the trail! About three tenths miles beyond the Devils Slide turnoff, the Chlkoot trail branches off to the east traveling further up Willow Creek. On the south side of Bass Lake, Goat Mountain fire lookout is accessible via the Spring Cove Trail (22E18) and the Goat Mountain Trail (22E94). 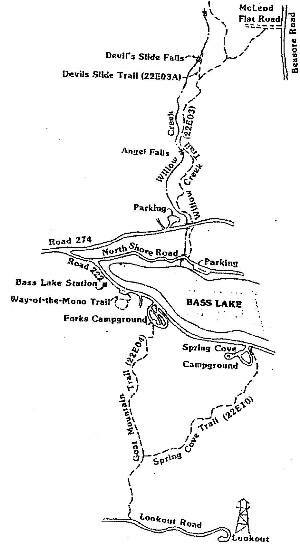 The Goat Mountain Trail begins in the Forks Campground and the Spring Cove Trail begins on the east side of the Spring Cove Campground entrance. It is about two and a half miles between the campgrounds. Both trails intersect in about an eighth of a mile, with another two and a half miles to the lookout. Both offer spectacular views of Bass Lake and mountains beyond. The walk is up hill, so plan for plenty of time and take plenty of water. Visitors curious about the first people to inhabit the area will want to visit the Way-of-the-Mono Interpretive Trail. This self-guided loop trail is about one half mile long, offering a spectacular vista point to view the lake and mountains. Signs along the trail describe who the Mono people were and how they lived. The trailhead is located across from the Little Denver Church Day Use Area and has an ample parking area.